ppadams: Right, I'll go second shall I? : I think ppadams is too much of a 4-4 fancier. Migeru: Should have been at . ppadams: Yes, I think you're right. At the time I'd not twigged it was 4-4. White looks in serious trouble already. BenH : We're meant to be able to live here, I think. Migeru: I think this is a mistake. Because of the three white stones in a line you want to play at before here, but before you can do that you need to play between and . Migeru: Bending like that at the head of the opponents' chain is severe. ppadams : Good Matt, be aggressive, make them live small. BenH: : Sorry to ignore your stone Ben, but I think this is necessary. BenS : Feel free to ignore my stones Ben. Think of it as a handicap that your partner is effectively placing stones at random to see what happens. ppadams : OK, bored of that corner now. Let's play elsewhere. BenH : I'm not sure you should have been bored. I think at would have killed it. Migeru: Well, let's figure that one out. MattHope: Agreed - I thought that (no offence BenS) that getting into a life and death in there would work in our favour even if it wasn't crystal clear. BenH: Well I'm not cringing -- that's what I'd have done. ppadams : hey, we could come in here. 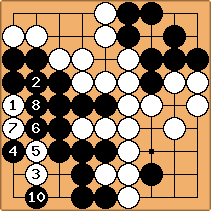 Migeru: I think this is a game-winning move, Peter. BenH : I can at least cut off one of the exits. ppadams : Not sure I'm going to count this as one of my better efforts. Migeru: This earns you 4 points in gote. It would have been better to either save it for later or play one space to the right, where it does threaten a monkey jump and is sente. BenH : I don't want any monkey jumps here. Migeru: This is necessary and sente, but there may be no monkey jump from because it is not solidly connected to other stones. On the other hand, the monkey jump would be on the 2-1 point, and strange things happen there, so I don't know. Migeru: F2 is solid, and honte. BenS : hmmm... not sure what I should be aiming to do at this point. Migeru: was gote, so tenuki. Bill: would be better at a.
ppadams : Back to here then - if only I'd not ignored earlier. BenH : Quite a big move by ppadams, but I think it's gote. 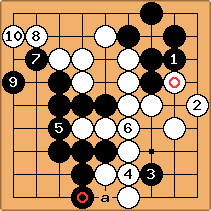 Migeru: the move itself must be answered as you did, but it leads to a gote sequence. It's worth 8 points. Migeru: you should have played one space higher. 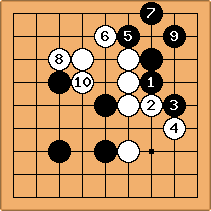 White could have captured the white stone to take back the 8 points, but again in gote. 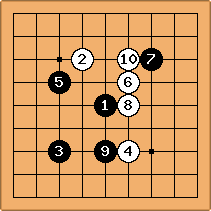 There are safe moves on the board that are sente but smaller than 8 points. Migeru: That is a sente worth zero points :-) In other words, kikashi, aji keshi and wasting a ko threat. unkx80: This could be the losing move. 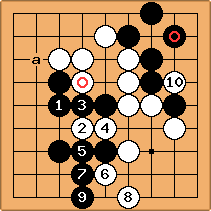 Previously, Black a is a one-point sente, but after the exchange, Black a becomes a gote neutral point. So it loses points. Migeru: I'm going to go out on a limb here and predict a white win by less than 2 points. Bill: Interesting question: Can White win by 2.5? BenH: I thought white was going to win by 1.5. If we're using chinese scoring, then either W loses by 0.5, wins by 1.5, or wins by 3.5 (or anything else in that progression). Were you using japanese scoring to get to 2.5? ppadams : Hmmm, best follow your lead I guess. Migeru: I would have played at . BenH: Did it matter? I thought they were both 1 point/move moves. On the left, the alternative has one more W move and one more W point. The centre alternative has one more B move and one more B point. Migeru: at threatens to cut in sente. BenH: But the cut turns out to be worthless, since the group can live. And even if W answers by connecting, that still leaves my analysis above valid: B has played one more local move than in the current version, and got one more local point, which is the same rate as can be achieved elsewhere. BenS : Nothing more to do top left i guess. Not sure what I should be aiming for now though. BenH: That's the right move. ppadams : I want this one more than that one. 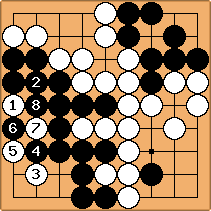 Migeru: It makes no difference to area scoring, but the other one would lose you a point in territory scoring. BenH : And we're done, and W wins by 1.5. Bill: What about the bottom left corner? Does White have something there? (Not that it matters for winning or losing.) Is it obvious? Suppose that White continued this way. What now? Migeru: The problem is not that white might make a live group, but that he might get seki. I think a is enough to kill white. Matthope : assuming A4 then then A4 again follwed by and I think that's it. Bill: Is this what you mean, Matthope? Then makes seki. Bill: Doing it in your head is worth more than getting it right. :-) You were only one move short. 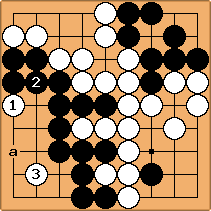 Xanthus: This looks like trouble for Black. I think at should do it. Throw-in if W plays at , if he doesn't I believe Black has just enough liberties. Bill: Comment. Even though White's speculative invasion should fail, I think making them can be both fun and instructive. unkx80: While this speculative invasion does not work in this case, it almost worked. I don't think the result is obvious to the 17k players. 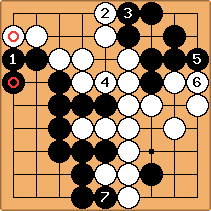 At least, Black has pretty bad aji and White has a bag full of ko-threats. This means that typically, the hanging connection at 39 should be a solid connection. Migeru: For what that's worth, I'm 9k and didn't find it obvious.